Are you a villain with your pen? Can you create a mystery that will have people biting their nails? Come and join in with the thrills, spills and quills! Take a peek into the dark side of stories and write something mysterious, scary and downright icky. Be creative … if you dare. 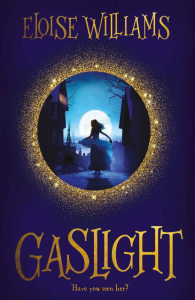 Eloise Williams‘ latest novel is the mystery story, Gaslight, set in Victorian Cardiff. Ideal for 10 – 14 year olds.